Q: What does Amit Varma have in common with Obama? A: Both decided to enlighten audiences with their insight into the 'indicators of fucked up life' of their countrymen. Obama had famously claimed that small-town Americans "cling" to guns and religion and xenophobia out of bitterness over lost jobs. Amit, following in Obama's footsteps, has explored the reason why Orissa villagers find hope in superstition, take up guns and join Naxalism. Ok, my question to you: What does the Jagannath Turtle have in common with Naxalism? Answer: They are both indicators of the fucked-up lives of so many of the people of rural India. There is no development, there is little chance of upward mobility, there is often no law and order. Their lives are so screwed that they actually derive hope from a turtle that they think is Lord Jagannath. How sad is that? So, according to Amit, the Orissa villagers are superstitious because of lack of development, abject poverty, no chance of upward mobility due to lack of opportunity, absence of law and order etc. Now some of us - the types who constantly mistake correlation for causation, might ponder over questions, such as, why, despite not lacking any of the aforementioned afflictions such as poverty, lack of opportunity etc. do most urban Indians follow all sorts of superstitious practices; from idol worship to numerology? Why do toasted bread slices bearing Jesus like silhouette sell for thousands of dollars on eBay in the US, a developed country which to my knowledge provides law and order and opportunities for its citizens? May be it is a trait peculiar to us, who mistake correlation for causation, to wonder, how, without any mention of Naxalism in the Reuters report, did Amit find out about Naxal activity in the area. Especially when the map of Naxal affected districts clearly shows that the eastern coast of Orissa (Kendrapara is just northeast of Bhubaneshwar) is not affected by Naxalism. It may be that those of us who do not go about applying a standard template to every situation and spit out posts, wasted our time by pausing upon reading that the villagers thought of the turtle as Lord Jagannath; not some tribal God. We obviously should not have read, let alone trusted, those loony leftist bleeding heart blogs when they told us that Naxals are mostly tribals who do not worship the standard Hindu Gods. I think, however, my skepticism is getting the best of me. Being an atheist and a rationalist shouldn't I be heartened by Amit's logic? If the reason "why people give in to such madness" is how abject their lives are, then all we have to do is wait for material prosperity. It is sure to wipe out the scourge of religion and superstition once and for all. This post is my response to Gaurav's and Kunal's comments on Kunal's post on Amit Varma and Ottoman. From a first principles stand point I suppose everyone opposes the bail-out. You will be hard pressed to find a person out there who says that he/she supports the bail out cheerfully and without any qualms. It is not hard to discern that whichever way you look at it, the taxpayers are being dished out a raw deal here. Most are in a catch-22 situation. Or a better analogy would be a Vikram Vetal situation. While they shoulder the burden of the Wall Street fat cats' greed and ponder what their response should be, Wall Street keeps whispering sinister questions in their ear about whether Damocles' sword will fall on them if they cut off the financial thread with which it is hanging on. However, if the taxpayer bails them out then it is a moral hazard and then the Vetal is free to do his shaitani again. Maybe not immediately, but when the memory of the crisis has receded. So you have taxpayers cornered. Not everyone knows economics and its not just lobbyist and Wall Street playing doomsayers but a variety of experts from varying ideological spectrum who think this is a once in a century crisis. The point I am trying to make is it is futile to talk about this from a first principles standpoint. If we start arguing from that angle then it precludes all discussion. You guys win hands down. Because you will always talk about how things would have been different in an ideal situation where markets were truly free. That has never happened, hadn't happened leading up to the crisis and as such an honest discussion about whether or not your ideology's prescriptions were at least partially responsible for the cause of the crisis can never take place. A doctor cannot make the argument that the drugs he prescribed to treat a patient for healing a wound did not work because the patient also had diabetes. Especially given that the patient had informed him before hand that he is a diabetic. Similarly, in spite of knowing the areas where there was or there would have been government intervention and voter pressure, if you prescribed policies that proved to be ineffective then you have to accept responsibility. You cannot shy away from the fact that these were one of the best years for your ideology in terms of favourable public opinion, political muscle and policy backing for your ideological prescriptions. Even if the prescriptions weren't implemented enough to your liking, they were still incrementally better implemented than in previous years. So now to take umbrage under the guise that it was no fault whatsoever of the ideological prescriptions since they were not implemented in their entirety is disingenuous. Regarding deregulation: Yes, it isn't entirely deregulation's fault as Democrats are shouting from the roof tops. But to deny that lack of regulation played no role in the crisis is not true either. Libertarians keep harping about the fact that banks are the most regulated entities. This is a complete non-sequitor. The crisis didn't happen because of the everyday regulated business of the banks. Rather it happened in the derivatives and credit default swaps markets which were entirely unregulated. There is absolutely no way of knowing what these contracts are, how many of these are there, what their value is, or whether the contracts could be fulfilled. All these because there was no regulation. Isn't transparency in contracts better for capitalism? Or has the defensive position you have to adopt wiped out the memory of your agenda to save capitalism from capitalists? Another place where you guys need to take a hard look at is the idea that market players can come up with a self-regulatory mechanism because it is in their interest to do so. Well, the rating agencies were supposed to do just that. But we all saw what happened when Moody's and S&P gave triple A ratings to risky mortgage backed securities. So what happened to the libertarian argument here? Just like Democrats are blaming deregulation free marketers are blaming Fannie and Freddie. Don't even get me started on the whining about how government forced sub-prime lending. Obviously, the banks didn't lend money to the poor out of any government pressure or out of any benevolence. They thought they could earn a hefty profit through sub-prime lending since the risk would be distributed owing to the trading in mortgage backed securities and derivatives. I don't get it. I mean how can Freddie and Fannie be solely responsible for this crisis? Partly, yes. They did add fuel to fire by starting to deal with sub prime mortgages since 2004 on the suggestion of Congress. But essentially they were buying up mortgages from the banks, freeing their capital and then bundling a lot of these mortgages together and selling it in the secondary market where Investment Bankers and Hedge Funds were placing speculative bets on their prices. In fact, Fannie and Freddie claim in their defense that it was not just the Congress but market conditions that forced them into dealing with sub prime mortgages because the mortgage lending firms like Countrywide were threatening to take their business lock stock and barrel to the investment bankers who were more than willing to buy sub-prime mortgages and bundle them their selves and sell it in the secondary market. This would have meant a loss in profits for Fannie and Freddie who were answerable to shareholders despite being quasi government entities. It was the secondary market, and the swaps market that was built upon this secondary market to cover the risk of a credit event that has frozen the financial pipes. Fannie and Freddie had an agenda which was known to everybody in the market and that was to inject capital in the markets and aid affordable housing. The fact that they had a government guarantee was known. Yes, they distorted the market. But I would assume the market to be efficient enough to warp around this distortion and in fact leverage it to their advantage. There are several different equilibriums/equilibria where the markets can stabilize, right? This is exactly what the markets had been doing from 1968 since the formation of Fannie Mae. Why wasn't there a crisis before this. It wasn't Fannie or Freddie's agenda that changed but the market's gambling on the securities and the derivatives that changed the game. One other gnawing issue is banker's compensation. Even Martin Wolf and Raghuram Rajan are writing about how the way the industry designs its compensation plans and bonus, results in perverse incentives to take the kind of short term risks that lead to crises like these. The banks know this is a problem as this has led to many crisis in the past. However, markets haven't come up with self-regulation to correct this. Banks have never changed their pay structure. Partly because if one bank does it and the other bank doesn't, the competitor might steal their best talent. But weren't the markets supposed to learn from their mistakes? This is a situation where no one wants to go first. Yes, you can say that it is the fault of the governments who keep bailing the banks out each time. But given that this (bail-out of banks after crisis) is bound to happen again and again with no change in the structure of compensation from the banks' side, should we just sit and watch repeated crisis unfold as leftists blame banker's greed and free marketers blame the government bailout? Gaurav your point about boom and bust cycles would have been well taken had the boom been experienced by the general economy. During the Bush years the middle class wages had stagnated. Of course, middle class did benefit in absolute terms because market innovations led to price declines in most items which might have been considered luxuries some time back. I am not disputing that. But when you have financial elite whose wealth grows exponentially, which instead of trickling down gives a semblance of trickling up while the regular Joe does not see his income rise, it is bound to raise questions about whether there really was a boom. The boom benefitted the rich disproportionately because of Bush's tax cuts which libertarians support. And now you find the regular Joe is having to bail out these same fat cats who enjoyed the boom to avoid a bust for themselves. The real question I think is whether it is better to digest a slight drop in growth with timely government intervention, despite its obvious inefficiencies and unintended consequences or let the growth be unhindered in spite of warning signs and then let everyone bear a massive hangover even though many didn't even get drunk. You guys' have always argued that the latter approach is better. Now in light of this crises I think the onus is on you to explain how and why? The world economy is plainly in a poor state, but it could get a lot worse. This is a time to put dogma and politics to one side and concentrate on pragmatic answers. That means more government intervention and co-operation in the short term than taxpayers, politicians or indeed free-market newspapers would normally like. This is from an editorial published by the Economist. Let me repeat, in case you missed. Not the Socialist Worker or the EPW, but the Economist. (this merits a spot on Ripley's believe it or not). Wow! What next? Amit Varma giving link love to left-leaning economists? Oh wait. Damn! Depression looms I tell you. All these ominous signs portend so. Do credits for Zohan include Eric Cartman or Awesom-O? Producer: We'll call it "Puppy Love"! Movie buffs, according to Time magazine, saw in Zohan inspirations from The Big Lebowski and Borat. Which clearly rules me out as a movie buff or redefines them as people with a very elastic imagination. I can't put into words the threat, visceral fear and a sense of dread I felt after reading Kanyadaan for the first time. It is my favourite play by Vijay Tendulkar. The theme is about an idealistic socialist who, having imbibed the values of equality in his daughter, is appalled by treatment meted out to her by her husband who is from a different caste. It shattered my idealistic notions about eradicating caste system through inter caste marriages. The play made me confront my liberal notions in a way that none of conservative opinion pieces written by thinkers ever could. I wrote the following comment on Aniruddha's blog where I have been a constant nuisance for the past couple of months. Those of you have read this play and have a different take on it please feel free to comment on it. I would love to hear about your perspective on this issue. Interestingly, my take from Kanyadan was different from yours. Of course, it exposes upper caste Maharashtrian hypocrisy. However, for me, the bigger take from the play was that it highlighted the complexities of solving sociological problems through a progressive framework. The venture of 'engineering' a society and shaping its values so that a moral order compatible with the times can be established is every thinking person's dream. But attempting to accomplish that by disbanding or trying to alter an older cultural framework such as ban on marriage between different castes, does lead to loss of knowledge accumulated by that older culture, however corrupt it may have been, and also results in an indeterminable risk for the person who is a victim/guinea pig for such an experiment because of the exposure to an alien knowledge frame with no prior documentation and acculatarisation to the solution of the problems that such ventures may generate. I thought the play illustrated this conundrum perfectly without ever taking sides. The upper caste family tried to solve/diffuse the problems through their historical knowledge frame about drinking and violent behaviour while the Dalit youth tried to approach issues in marriage through his learnt/observed behaviour or cultural framework from his impoverished childhood. Since both families had no recourse to a third knowledge framework to solve, mitigate, issues arising out of an inter-caste marriage, apart from a feel good, 'everyone is equal' kind of socialist framework of the father, which might sound great as rhetoric but never gives a concrete path to resolve the problems that crop up for the unfortunate guinea pig in such experiements. The play, I thought, tried to highlight these complexities and I always am fascinated by Tendulkar's ability to go far beyond the typical Maharashtrian upper-caste acculturisation that he himself must have underwent and write stories so raw and visceral that one would have expected from someone like Namdeo Dhasal who probably has borne the violence that Tendulkar explores so unnervingly in his plays. This news from Pune had me in splits. After being under construction for several months, the Pune Municipal Corporation (PMC) has finally re-opened the concretised stretch between Karishma building and Karve statue for traffic on Thursday. Last month, activists and residents of the area protested in a unique manner by cutting a cake as the repair work on Karve Road entered its third year. Had anyone taken a MMS of Arun Patnaik - Joint Commissioner of Mumbai Police's conduct after the Mumbai blasts, it would have been more iconic and symptomatic of police apathy than this accompanying photograph. During times of crisis, precisely when swift police action is of utmost importance, these guys are busy, protecting of all things, their own clothes from getting wet. According to an CNN-IBN eyewitness account, Patnaik wouldn't get down from his official car and inspect the scene of the blasts, till a umbrella was provided to him. This wasn't the only insensitive thing this chap did in the day. Gaurav, who did an amazing job with his timeline, wrote that Patnaik was busy playing the blame game on Television immediately after the blasts. On CNBC, Patnaik was quick to shirk off blame saying security in trains is the responsibility of Railway Police. This when the first priority should have been getting as much information, forensic as well as otherwise, possible from the crime scene. I didn't know whether to laugh or cry at this insane display of arrogance, insensitivity and vanity amidst such a major tragedy. The citizen journalist's eyewitness account on CNN-IBN spoke about how ordinary people who were themselves victims of the blasts were helping each other spontaneously and in contrast this JCP was warming his arse. I would like to specially thank the Mahim Zone ACP Desai and his team. He was very active in the whole operation, although he is very aged but still actively got involved in the rescue operation. 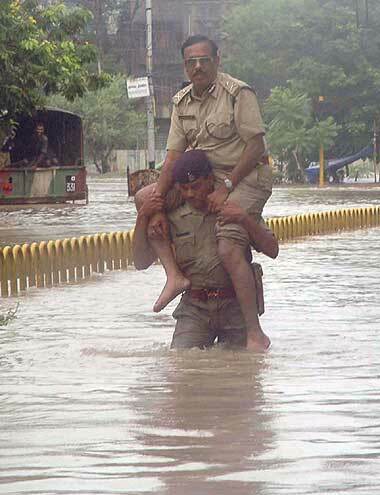 I would also like to mention Arun Patnaik - Joint Commissioner of Mumbai Police. He didn't get down from his official car, till a umbrella was provided to him. Local boys from the area did a good service of maintaining the traffic. I waited till the bomb squad arrived, and then a police tape was put around the blast area. This reminded me of two similar and equally disgusting instances of authority figures who were fiddling while cities burnt around them. First, the person in the accompanying photograph, K Kumaraswamy - JCP Vadodara who during Gujarat floods in 2005 who should enter record books for ensuring that his pants didn't get wet in waist deep waters. Second of course was Brownie. FEMA chief Michael Brown was busy discussing his wardrobe during the crisis caused by Hurricane Katrina. "My eyes must certainly be deceiving me. You look fabulous and I'm not talking the makeup," writes Cindy Taylor, FEMA's deputy director of public affairs to Brown on 7:10 a.m. local time on Aug. 29. "I got it at Nordstroms," Brown writes back. "Are you proud of me? Can I quit now? Can I go home?" An hour later, Brown adds: "If you'll look at my lovely FEMA attire, you'll really vomit. I am a fashion god." What are these people high on? Asli tidik bharte na hey asla vachlyavar... Shapath!